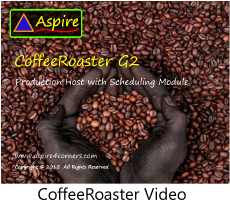 The Roaster Module is one of the most important additions to CoffeeRoaster in recent years. The module adds the ability to log both Pre Roast Blend and Post Roast Blend Roast activities in addition to tracking Single Origin Lot values by Roast. The form below is an example of a Roast Log for Pre Roast Blends and Single Origins roasted for direct bagging. Roast entries are made from previously configured Roasts, Roast Formulas and a 'Current Lot' field reprersenting the lot number currently being used for each Single Origin. 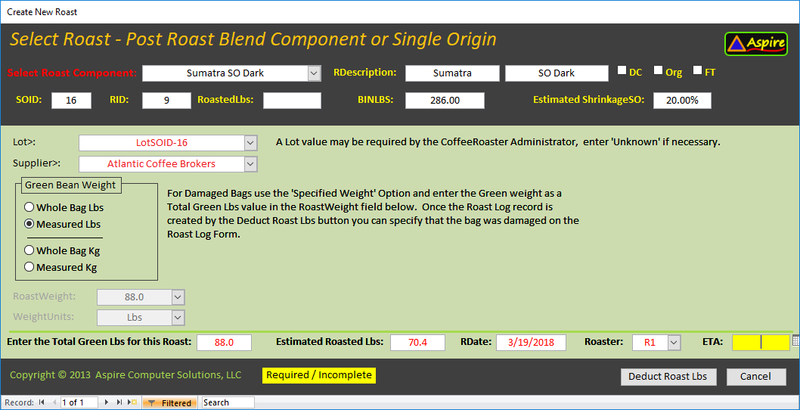 In the New Roast Log form below, the operator needs only to select a Roast from the combo box, and then enter the Total Green Lbs value. CoffeeRoaster then estimates the Roast Yield, enters the Roast Date. 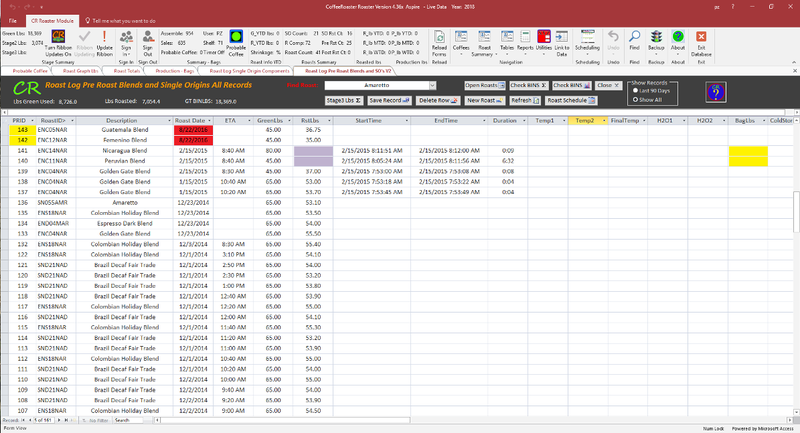 Next the Roaster selects the Roaster and optionally enters an ETA (Estimated Time of Arrival). 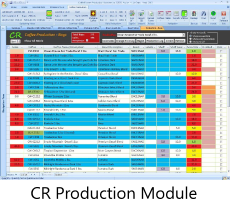 CoffeeRoaster then shows the availability of the Roast Components and whether there is enough Green Beans to complete each Roast Component. In the form below, it is clear that there are insufficient Green Beans for the Mexico Single Origin which would prevent this roast from proceeding. 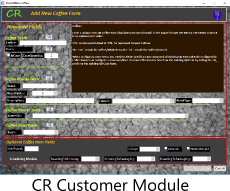 You can then select a temporary substitution through the form below or use another form to change Roast Formulas by replacing the insufficient Single Origin with another Single Origin. The Post Roast Blend Model is different from the Pre Roast Blend Model in that each Roast contains a Single Roast Component rather than a blend of different Single Origins. This provides a great deal of flexibility on Roast Shrinkages allowing Blends formed by Single Origin Roasts to have a great degree of flavor diversity. 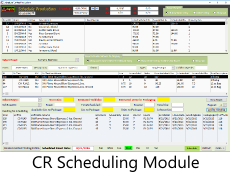 In the form below we can see a roast log from Single Origin Components. 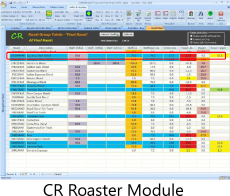 As each Roast is created the 'Current Lot' field will be added to the Roast data. In the New Roast form below for Single Origin Components, the roaster selects the Roast Component and whether a whole bag will be roasted or a partial 'measured' quantity. 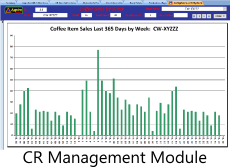 CoffeeRoaster then calculates the estimated Roast Yield and populates the Roast Date field. The Roaster then selects the Roaster and optionally enters the ETA. 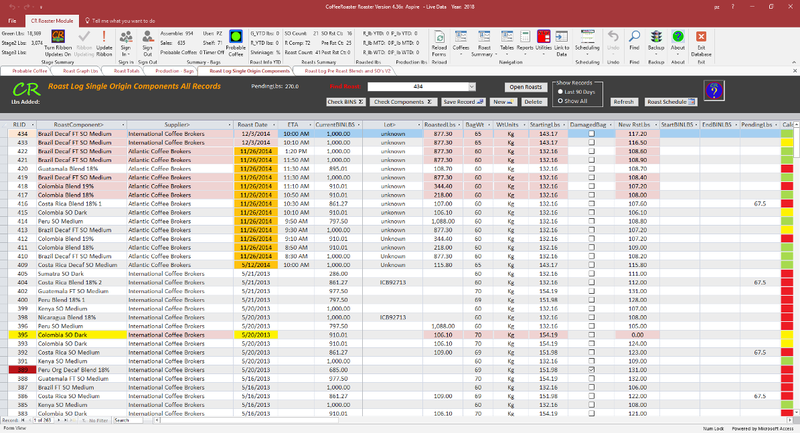 The Roast Module features multiple reports to help manage Single Origins, Roast Formulas and Roasts by Lot.